I was going through my nightly ritual of channel-hopping before going to bed the other night when I lighted on a station called ‘TBN’. 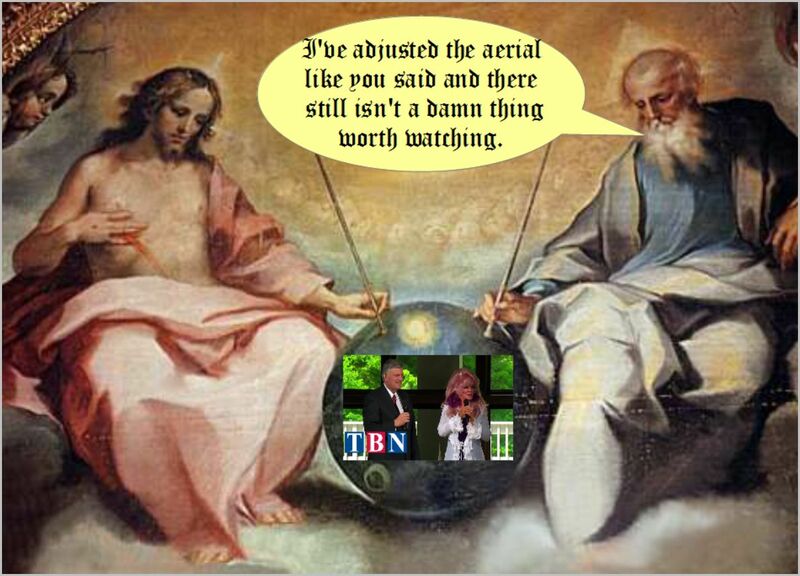 ‘TBN’, for the uninitiated, stands for ‘Trinity Broadcasting Network’. It is managed and operated by a posse known only as the Father, Son and Holy Spirit. No-one else is involved. These three have decided the best way to get the word out to the masses is to do it on the TV, which, I suppose, beats the old-tech approach. I mean, who reads books these days? The Father, Son and Holy Spirit Collective was evidently having a night off and had delegated the job of running the station to an ordinary mortal (whose name I was sure I’d remember but have already forgotten). This chap was telling everyone – I say ‘everyone’ though he was standing in an empty attic – just how much God loves us and yearns to heal us. That was his word, ‘yearns’, which means to desire strongly or to ache to do something. Starting tomorrow at 12.00 the Lord God Almighty will be curing every illness, healing every psychological and physical ailment and eradicating all illness, just like he said he would way back when (in Isaiah 35.5 and Matthew 11.5 if you’re interested). Okay, he’s a little behind schedule but he’s been busy and, well, better late than never. If the Lord doesn’t care for either of these splendid options then surely he can come up with a better alternative; according to his human mouthpieces, he sends storms and earthquakes when he’s unhappy, so he could easily conjure up something nice for a change. He’s a creative sort, after all. Not to mention omnipotent. Now I know there are a couple of theological flies in the ointment that would make all of this difficult for him. The first is Kryptonite. Or human sin… one or the other. But he could obliterate this at the same time, couldn’t he; make us all perfect first then the Kryptonite couldn’t harm him while he’s busy fixing us. I know, you’re going to tell me this would be an infringement of our free-will. But there’s nothing Biblical about free-will. God’s never been keen on it, preferring instead to choose his buddies up front, and in any case, he’s going to eliminate it completely once they’re all taken up into Heaven. So it really wouldn’t hurt him to make some sort of decision about it now. With free-will gone he could just get down to the business of making us all better, not forgetting to take credit for his work in one of the mysterious ways I’ve suggested. ‘What’s in it for God?’ I hear you ask. Well, my tele-evangelist failed to say, but I can think of at least three benefits: 1. He’d get over his ache. Instead of just yearning to do something about disease he’d have actually done something and this would make him feel a whole lot better about himself. 2. He wouldn’t have to worry about Kryptonite any more. 3. He’d have lots of new friends that he wouldn’t then have to consign to Hell. To be honest, I can’t see why God hasn’t done something like this already. His first idea, to bully a load of ancient tribesmen into submission, didn’t work so well and Plan B just ended in tears. Let’s face it, it wasn’t the greatest of ideas. This though is a far better option. So if you’re listening God, it’s yours, gratis. This entry was posted in 'Proof' of God, Christian failure, Christian Priorities, Christianity's failure to deliver, In God's name, The Bible's unreliability and tagged false promises, God, hypocrisy by Neil. Bookmark the permalink. Finally someone else sees it. Since my teens through my thirties I wondered why god didn’t make a perfect world if he planned on fixing it by taking sin away anyway. And further, how would that work – Adam and Eve supposedly were perfect but still fell, why wouldn’t more humans fall in eternity? Then I grew up. It took a while but I realized Adam and Eve weren’t real, they were just a polemic against Mesopotamian myth. And Yahweh was just a myth too. Great post, cheers. Yes, indeed. And if God always intended us to be spiritual beings, why did he (and does he) make us physical creatures? None of it makes any sense. Great blog, by the way.